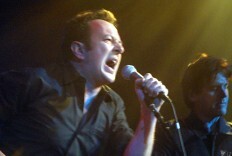 Joe Strummer and his band the “Mescaleros” came to New York to play five shows at the new venue “St. Ann’s Warehouse” under the Brooklyn Bridge. What a week it was! The shows were great and we stayed up partying till dawn each night. Joe played new material from the Mescaleros two albums, as well as some old favorites from the Clash days.